The #1 label software for Mac includes everything you need to create labels, envelopes, & letterhead. Labelist is the fastest way to design and print professional labels, and more on your Mac. Its modern design eliminates the headaches typically associated with printing these items so you can get your work done faster. * NEW! 8 Vintage photo effects: B&W, fade, warm, cool, bold, instant, etc. NEW 9.0 FEATURE: iTunes integration. 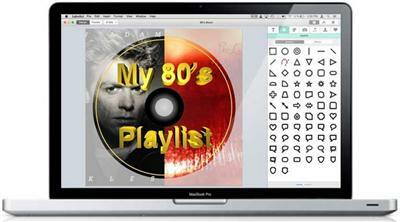 Labelist makes it easy to create CD/DVD labels and jewel cases that feature your iTunes playlists and album cover art. Use the built-in iTunes browser to place this information directly on your design where you can customize it. NEW 9.0 FEATURE: Photos integration. Easily access your photos from Apple's new Photos application. The all-new photos browser supports face searching, favorite searching, and place searching. NEW 9.0 FEATURE: 3D Headlines. Are you looking for an eye-catching way to present your business or product? If so, use a 3D headline to easily give your printed labels, envelopes, & letterhead a sophistication usually only achievable by professional designers. You get to control everything: the materials used for the headline, the lighting, the reflections, the 3-dimension perspective, and more. You'll be amazed how easy and fun it is to experiment with different looks. NEW 9.0 FEATURE: Instant paper texture overlays. Labelist 9 uses advanced image compositing to blend built-in paper textures with your photos. The textures make it simple to customize your photos with a variety of different motifs (rich, sophisticated, antique, etc). Choose from textures like canvas, linen, creased, crumpled, and more. NEW 9.0 FEATURE: Instant glass texture overlays. You can also turn a photo into a standalone work-of-art on your label by applying a glass texture to it - perfect for backgrounds and design elements. NEW 9.0 FEATURE: Instant old film look overlays. This all-new feature adds dust specks, scratch marks, and creases to a photo to give it a vintage look.